Great price for a wireless charger. 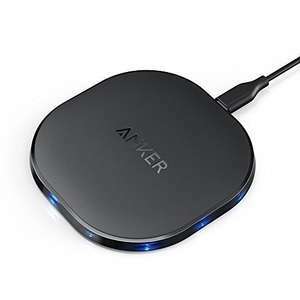 I have used Anker products for a while. They are of a good quality. More importantly their after-service is great, should anything go wrong. I'm not too sure, however, having looked at the description, S7 has a fast charge feature which is supported by this. So i think it's around 2hours 20 minutes to a full charge. I have this and love it! I only ever charge over night so can’t really comment at speed to charge, however when I first got it I slapped my ‘very popular often slated’ phone on the charger for an hour and it charged over half the battery. Blue light flashes three times to say charging then no permanent light which is great for those that charge it in the bedroom! It’s great!!! Has it also caused the keyboard to malfunction? If you want fast charge don't use wireless it will get very hot and degrade the battery faster than a cable. I have this and love it! I only ever charge over night so can’t really c …I have this and love it! I only ever charge over night so can’t really comment at speed to charge, however when I first got it I slapped my ‘very popular often slated’ phone on the charger for an hour and it charged over half the battery. Blue light flashes three times to say charging then no permanent light which is great for those that charge it in the bedroom! It’s great!! !